Super Impose Clearshift© allows 3 tools in the cut simultaneously! See at IMTS Booth # S-8381. The Eurotech Rapido Dual-Y with powerful 15 HP on both main and sub spindles, 1.42" bar capacity, 4" chuck, Y axis on both turrets, up to 48 tools. The staff at Modern Applications News would like to wish you and your family a Merry Christmas and Happy New Year! As we look back on 2013, we are encouraged to report that the metalworking industry remains at the forefront of an improving economy. With the recent report that U.S. manufacturing growth is at its fastest pace in 2 1/2 years, the outlook for 2014 is bright. The same can be said for us here at Nelson Publishing. Our eNewsletters -- Modern Applications News (MAN), Tooling & Production (T&P), and the Manufacturing Center Product Spotlight have experienced exponential growth over the last few years. Our lists of subscribers and advertising partners have expanded at a rapid rate. We are grateful. We are also excited by the thought of even brighter days ahead. But first, we wanted to take one final look back at some of the more interesting happenings in the past year. While T&P's proud history dates back to 1934 and MAN's to 1967, we thought we would commemorate this being the 8th year of our eNewsletter program in this "Best of 2013" issue. We have compiled two "Great 8" lists -- the Most Interesting Features and Most Interesting New Products, as judged by our readers. We hope you enjoy these stories and catch some helpful information you may have missed the first time around. Again, we want to thank you for your loyalty to our publications and we'd like to wish you a successful and prosperous 2014! A "Quik"decision by Kirby Risk Precision Machining reduced reaming time by 7 to 1 and tool change time from 2 hours to 7 minutes. Concerns about dermatology in a machine shop? This sounds more like discussing ballet on the baseball field. Dermatitis is not a general complaint among grinder operators, but finding a solution to the problem was almost as tricky as finding a prima ballerina who can pitch for the majors. In today’s technical marketplace, there is a constant need for gathering three-dimensional data on parts and products. Whether it’s small machined parts requiring precision diameters, alignment of large equipment or setting up machine tools, dimensional measurement data can help companies make more informed decisions and produce better quality products. Collecting these results in 3D provides greater insight into data, allowing companies to have more confidence in the level of accuracy and comprehensiveness of their measurements, all while becoming more efficient. James Tool's strategy to acquire the latest machine tools and other technologies has led to expansion and a valuable certification. At Suburban Manufacturing, employees are given the chance to innovate and redesign processes. That policy, along with a switch to Okuma's horizontal machining centers, has allowed this "true job shop" to better compete for business. It didn't take long for Custom Gear & Machine to take advantage of its new Reishauer grinder and Siemens digital NC system. "We were making parts within a few days after the installation." New Eurotech machines have eliminated all manual operations, sealed in better accuracy and kept a team-driven, family environment at Seekonk Manufacturing in Massachusetts. "It's amazing; you put in a raw piece of steel and it comes out looking like a jewel with the Eurotechs." One-Touch Swing Clamps Provide Clamping Forces Up to 800 lbs. 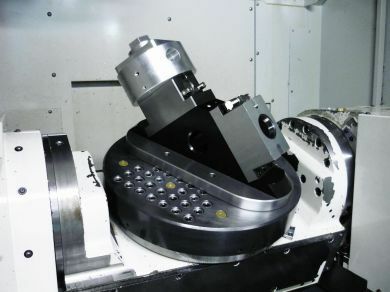 Smart New 5-Axis Vise's Novel Design of Pulling Jaws Together at the Top is Pure "Genius"